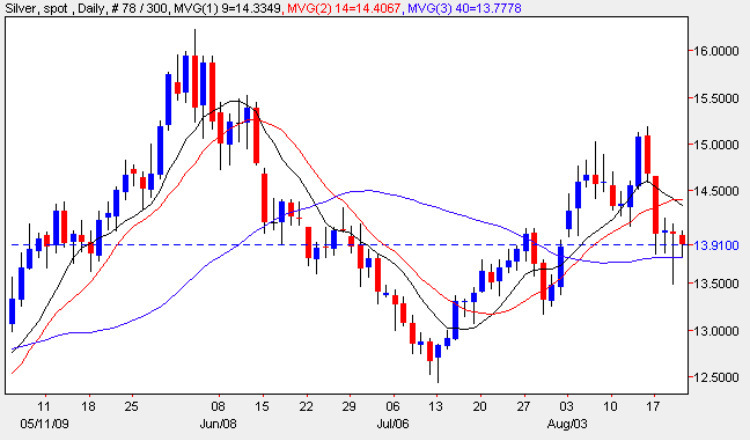 As equity markets appear to be holding their nerve and the dollar teeters on the edge of yet more negative sentiment, silver prices are currently trying to re-base the $14 per ounce level and indeed the last four days’ candles have all been characterized with lower wicks of varying lengths but interestingly all these wicks seem to be finding support at the 40 day moving average. Wednesday’s candle was particularly interesting as the depth of the lower shadow was extreme in comparison to the upper body suggesting that the commodity has found some support at this level. The combination of the 40 day moving average with the support at this key price handle suggests that we should see silver prices rise in the short term. My trading suggestion for tomorrow, Friday position squaring notwithstanding, is to look for small long trades on an intra day basis using the 30 minute to find suitable entry and exit points but keeping in mind that the $14.50 resistance level above is extremely strong and will take a degree of effort and momentum to penetrate. Only a break and hold the $15 per ounce level will indicate a continuation of the current recent trend which began in early July and until this occurs silver trading will be limited to (as for gold) to a series of short term scalping opportunities. Finally keep an eye on the USD Index which still looks feeble, to say the least, and in danger of a total collapse. The short and long term trends are bullish while the medium term trend is sideways.